has serious consequences for the development and wellbeing of children living with violence. 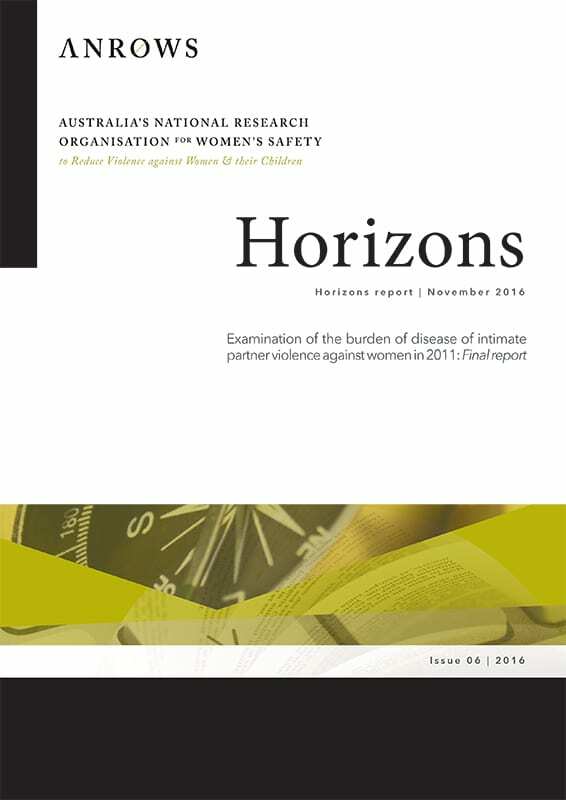 There has been no decrease in the prevalence or health burden of intimate partner violence since both were last measured in Australia. Intimate partner violence and its health impacts are preventable. preventing violence from occurring in the first place by addressing known root causes. Because experiencing intimate partner violence increases the risk of health problems, to substantially reduce the health burden, it will be necessary to prevent new cases of violence. This will require a greater emphasis on early intervention and primary prevention to stop violence from occurring in the first place. There is agreement among expert bodies that reducing intimate partner violence and the health burden it causes will require a coordinated approach involving all levels of prevention and all sectors of society (Michau, Horn, Bank, Dutt, & Zimmerman, 2014; UN Women, 2015). Australia is well placed to achieve this because the Commonwealth and state and territory governments have agreed to a coordinated national approach in the National Plan to Reduce Violence against Women and their Children 2010-2022 (Council of Australian Governments, 2011). This study shows that it will be important to continue to support and strengthen this national approach. There is a particular need for a focus on reducing violence affecting Indigenous women, and other groups of women experiencing more prevalent, severe or frequent violence. 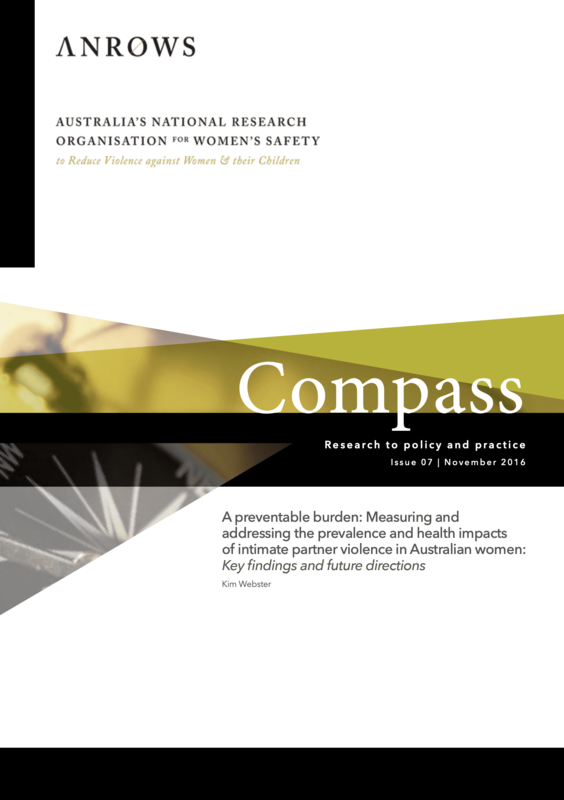 ANROWS Compass (Research to policy and practice papers) are concise papers that summarise key findings of research on violence against women and their children, including research produced under ANROWS’s research program, and provide advice on the implications for policy and practice. Webster, K. (2016). 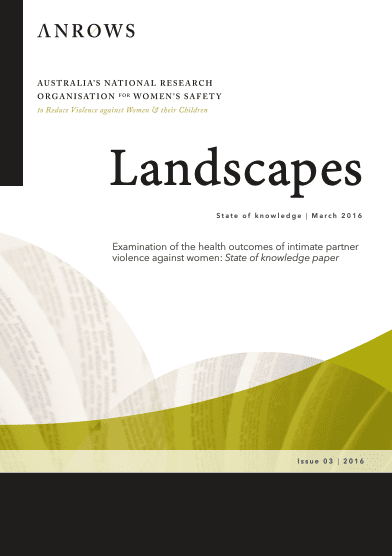 A preventable burden: Measuring and addressing the prevalence and health impacts of intimate partner violence in Australian women (ANROWS Compass, 07/2016). Sydney, NSW: ANROWS.